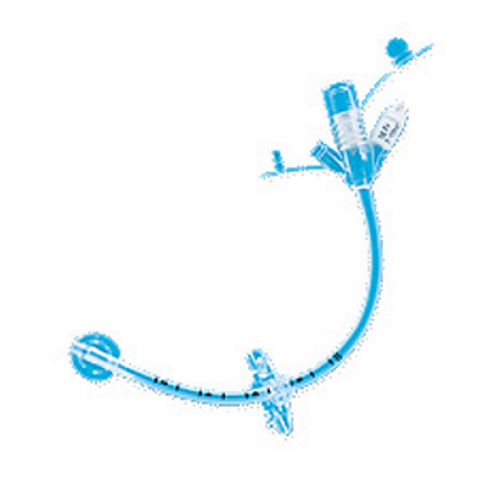 Kimberly Clark Mic Key Gastrostomy Tubes enable caretakers and in-home patients to deliver enteral nutrition to the stomach. 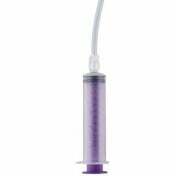 The Mic Key Feeding Tube features medical grade silicone construction and delivers optimal performance and value to users. They also include a conventional and low-profile design. Its ventilated Secur-Lok external retention ring provides optimal stoma health through enhanced air circulation around the stoma and also helps prevent migration of the tube itself. 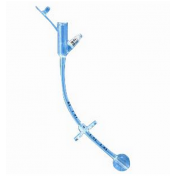 For a well-respected and widely used gastrostomy tube, the Kimberly Clark Gastrostomy Feeding Tube is a great choice. Let’s walkthrough a typical feeding procedure from start to finish. It is simple and logical. It will be second nature to you in no time. Before you do anything else, wash your hands every time. This is very important. Before feeding, use a small amount of water to flush and pre-lubricate the extension set and tube. 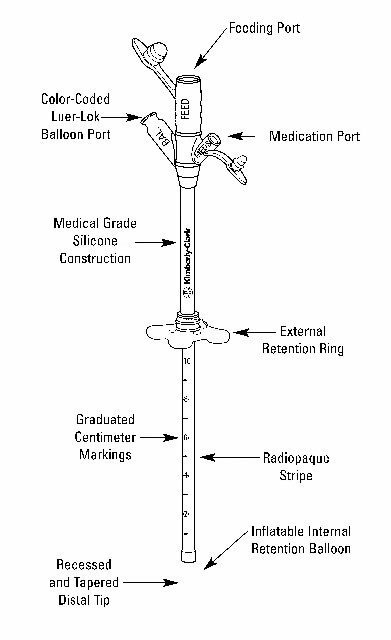 Be sure you check the MIC-KEY Feeding Tube before each feeding to make sure that it’s still in position. It’s a simple procedure. For details, consult your guide book or ask your nurse or doctor. Now that you’ve done the prep, let’s see how a feeding setup works. Just follow these steps: Using the appropriate extension set as your doctor has directed, connect the extension set to the MIC-KEY feeding port. Align the black line on the extension set connector with the line on the feeding port. Push it in to the anti-reflux valve and turn it clockwise. To disconnect after feeding, realign the black line and pull out the extension set connector. 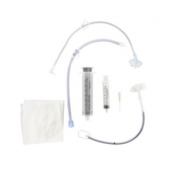 If your doctor has prescribed continuous feeding, connect the continuous extension set to the set connector from the feeding bag with a firm push and twist. Wetting the set connector before insertion, they provide a more secure connection. 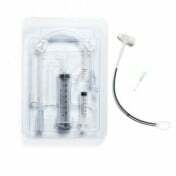 For a bolus feeding, connect the bolus extension set to the catheter tip syringe with a firm push and twist. Finally, your doctor may have recommended that you check for proper placement before each feeding. For more details on how to do this, refer to your care guide or contact your healthcare professional. 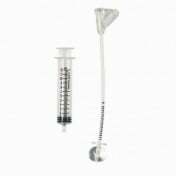 Our old feeding tube had a clamp/clip on it to prevent the contents of the stomach from exiting the tube to the outside when the rubber cap is dislodged/opened by accident. The clamp looks like the one pictured o the MIC-Key Tube Secur Lok Extension Feeding sets. Do any of the feeding tubes come with these clamps? Without the clamp each time the cap comes open the contents of the stomach come back out through the tube. I had a new button put in. It leaks around the button. What is the cause of this? The product works as described. The service was fine. The product itself, which I have ordered at least six times since 2011, is very good. The packaging for shipment, however, is ridiculously wasteful: a cardboard container 14 inches deep, 18 inches long and 12 inches wide filled with plastic envelopes for a strong paper box 6 inches by 13 inches by 7 inches. A padded envelope or a normal FedEx sized box would have been enough protection. the tube is as good as any other tube brand that has been put in me. it is also the best price ive have gotten. I received excellent service and have had a wonderful experience ordering thru Vitality Medical! I am very pleased! The service I received from Vitality was excellent. The product was exactly what I needed and they shipped it to me quickly! 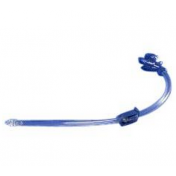 My experience ordering the mic gastrosyomy tube from Vitality was excellent! As a nurse, I use this product to my patients. It acts as unobtrusive and has concealing features. The external surface that is very minute is known for regulation of air circulation surrounding the stoma. It is easy to handle by patient too. It is available in over 22 sizes to make sure comfortable, proper fit to fight gastric leakage. It has got anti-reflux valve that lies in immediacy. This is something that we use everyday at the pediatric ward where I am assigned. There are times that there are children who find it hard to chew their food due to neuro-muscular disorder and this is what works for for them. We sometimes advise parents to purchase these if they want to take their kids home and just hire a caregiver or private nurse. I don't have any complains since I've used it.